The first record of a Quaker Meeting in Brentford was in 1659, after which one John Tysoe went along to the parish church (the “steeplehouse” in Quaker-speak) and began to exhort the congregation to repentance. For his pains he was put in the stocks, and then brought before the magistrate, who sent him to Newgate gaol. Tysoe was to be imprisoned intermittently over the next thirty years, until the Toleration Act 1689 made it lawful for Dissenters, including Quakers, to hold Meeting for Worship. A permanent Meeting for Worship was established at Brentford in 1706 in a barn near the Goat Inn, Ferry Lane – and it is possible that William Penn, who for a time lived nearby, might have been an early worshipper. The present Meeting House, which is Grade II listed, was built on land in Conduit Lane – now Quaker Lane – purchased from Benjamin Angell for £35 in 1785. Angell, who was an Elder and Clerk of Longford Monthly Meeting for several years, had inherited a large estate from his father and made his own fortune as a printer and a dyer. 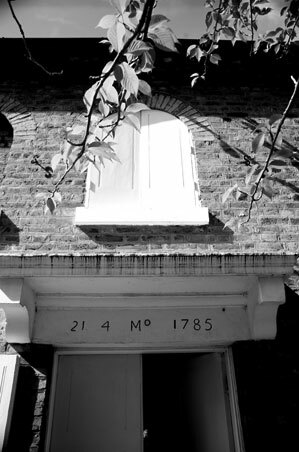 The date carved over the door is 21 4 Mo 1785 – 21 April – and Friends began meeting there regularly in October of that year. The building, which is very similar to those at Esher and Uxbridge, is in plain Georgian domestic style, and surrounding it is the Quaker burial-ground for West London and the garden. Inside, it has a gallery with sliding partitions at the front which can be used to close it off as a separate room: it is now used to house the Meeting’s library. Facing the main body of the meeting room is a raised gallery, about two feet above floor level which, until the practice ceased in 1924, was used by Recorded Ministers whose ministry was regarded as particularly acceptable. The main meeting-room today is little different from the way it was in 1785, though men and women no longer sit on opposite sides of the room and, in any case, the benches are now arranged in a square, rather than in serried ranks facing the Ministers’ gallery. However, the building has undergone a certain amount of alteration and extension since it was first opened. In 1940 it was bombed and the front wall badly damaged; and for the next ten years, Meetings for Worship were held in “The Barn”, now demolished, in the Meeting House grounds. The premises were also extended by the addition of a children’s room and a small kitchen. In addition, the original grounds were more extensive than today; in 1978 part of the land was leased to the Shepherds Bush Housing Association for the building of Angell House, which contains nine dwellings, one of which is used by our Resident Friend.